R-Tech Dental offers several different levels and types of maintenance training. We can come to your office, or your group’s meeting hall and vary our maintenance talks to your specific needs. 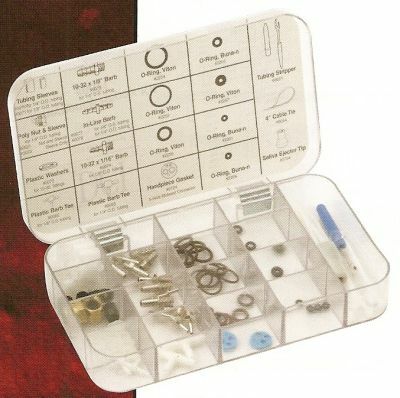 If we are in your office on a normal service call, we will be happy to show your staff how to repair a syringe, how to maintain the normal operation of the air compressor, how to test your ultrasonic cleaner, or how to change an amalgam separator cartridge. We are always happy to disseminate the knowledge that we have of dental equipment to your staff to make that piece of equipment work better, last longer, and to keep it that way with the least amount of effort. We naturally tend to do this type of training anytime that we are in an office. It is just a habit that we have. This type of training usually takes a couple of hours and involves a small group of people the you want to be responsible for maintenance. We make our way through the office showing and talking about proper care for all of the dental equipment. During this session, we work off of a walk-through list like the one listed below. Along the way we establish which parts and tools will be needed by the staff to accomplish the maintenance and repairs that they feel comfortable doing. We can tailor these talks to cover as little or as much as you want. 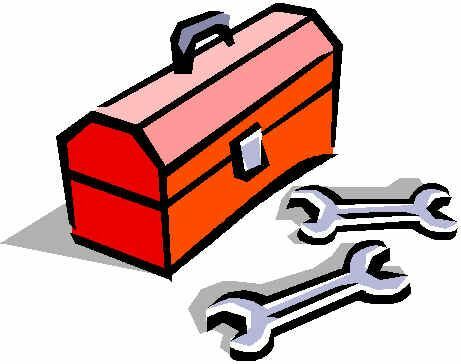 The cost for this service is our normal billing rate plus any parts or tools that may be purchased. We have given seminars on various topics ranging from clean water systems to equipment maintenance to X-Rays. During these seminars, we usually like to bring sample products and demos in that can be passed around. We feel it is important to not only talk about these things, but for people to have that “hands-on” experience as well. We have given these seminars to large groups of dentists, groups of assistants, and groups of hygienists using handouts and computerized power point presentations. As we put a lot of effort into these, lots of prior notice is needed as well as expected head counts so that we can be properly prepared with handouts and free manufacturer samples. These dental seminars are normally a for-fee service, but we have given some seminars for free to certain groups based on the hope that members of the group will call us to order products and services. 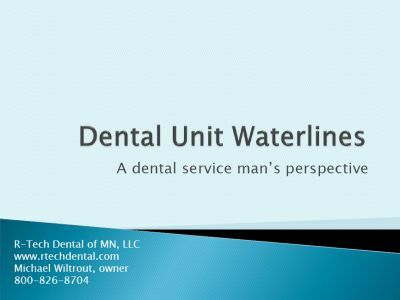 Below is a sample power point presentation on dental unit water lines (DUWL).